Facebook reported mixed third-quarter results on Tuesday. The social-media giant said US daily active users held at 185 million. Shares rallied more than 5% ahead of Wednesday’s opening bell. Facebook was set to open higher by more than 5% Wednesday after reporting mixed third-quarter results. 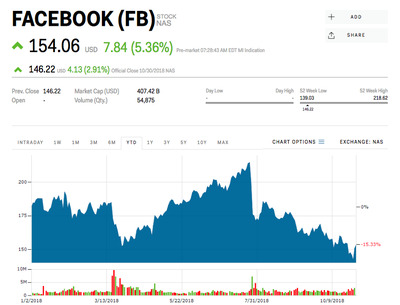 The social-media giant announced Tuesday that it earned $US1.76 a share, easily beating the $US1.47 that Wall Street analyst surveyed by Bloomberg were expecting. Revenue surged 33% versus a year ago to $US13.73 billion, but that was shy of the $US13.80 billion that was expected. Facebook said its US daily active users held at 185 million, coming as a relief to investors after a tumultuous few months. The company has been trying to repair the reputational damage done by the recent scandals, including Cambridge Analytica and the hack of 30 million users’ sensitive data. “Growth is decelerating, yet ’19 seems to be a pivot point with investment stabilizing,” the Jefferies analyst Brent Thill said in a note sent out to clients following the results. Last quarter, Facebook said its monthly active users in the US stalled and warned that revenue growth rates would decline by “high single digit” percentages in the coming quarters. Shares had plunged 35% through Tuesday after that report, sending Facebook shares to their lowest level since April 2017.